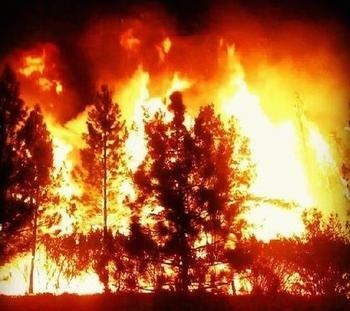 SACRAMENTO, California, August 24, 2013 (ENS) – A raging wildfire spreading into Yosemite National Park has damaged electricity infrastructure serving the city of San Francisco 200 miles to the west, forcing California Governor Jerry Brown to declare a State of Emergency in the city. San Francisco’s water may become cloudier over the weekend due to ash from the fire, but officials said Friday there is no immediate threat to the city’s water supply. The Rim Fire has burned to within 2.5 miles of the Hetch Hetchy Reservoir, formed by O’Shaughnessy Dam on the Tuolumne River at the lower end of Hetch Hetchy Valley in Yosemite National Park, about 160 miles east of San Francisco. The reservoir supplies about about 85 percent of San Francisco’s water, and the dam and its powerhouses produce the electricity used to power city buildings and Muni buses, light rail, streetcars and cable cars. On Monday, two of the three powerhouses were closed as a precaution. The fire consumed those areas and also blazed across an area where 12.5 miles of high-voltage wires are located, SFPUC officials said Friday. It is not possible to determine how badly damaged the power lines are, as fire officials have closed the area to all but fire crews. The remaining powerhouse has been producing 50 of the 160 megawatts needed by San Francisco every day. The other 110 megawatts has been purchased from the grid, said SFPUC officials. The Rim Fire continues to exhibit very large fire growth due to extremely dry fuels and inaccessible terrain. At least 11,000 acres, 17 square miles, has burned inside Yosemite National Park in a remote area of backcountry. Yosemite officials are warning hikers to stay out of that region, and have stopped issuing some backcountry permits. More than 2,670 personnel are working toward increasing containment of the Rim Fire, which has now charred 125,620 acres, 196 square miles, and is just five percent contained. Fire incident commanders are directing a major effort to hold the fire east of the North Fork of the Tuolumne River. Fire crews have strengthened fire lines that are holding above the community of Pine Mountain Lake. “Additional efforts are focused on the eastern edge of the fire in Yosemite National Park to minimize impacts to our national treasure,” the incident command team said this morning. Most of Yosemite National Park is not affected by the fire and is relatively smoke-free, park officials say. The northern part of the park, including part of Tioga Road, does have some smoke. Highway 120 is still closed to motorists wishing to travel between Groveland and Yosemite. Hodgdon Meadow Campground and Hetch Hetchy Backpackers’ Campground are closed. All other Yosemite campgrounds are open. Merced and Tuolumne groves of giant sequoias are closed to visitors. Direct attack is being used in some areas of the fire and more will be utilized as firefighters gain safe access. To date, one firefighter has been injured and 16 structures have been destroyed. In other areas of the fire where extremely steep, rugged and inaccessible terrain exist, fire crews are using a tactic called indirect attack which creates control lines away from the fires active edge. Several helicopters and air tankers, are dropping retardants to slow the forward progress of the fire burning in brush, oaks, and pines. The Tuolumne County Sheriff’s Office has issued an evacuation advisory for Tuolumne City and nearby areas along the Highway 108 corridor. All access to Tuolumne City is denied to anyone who is not a resident or a member of the Rim Fire emergency crews. 4,500 structures are considered threatened, and 11 homes and 12 outbuildings have been destroyed. In Sonora, the Walmart store is closed today due to smoke. Manager Jennifer Gordon says the building is older and the ventilation system is having trouble managing the heavy smoke. Smoke from the Rim Fire is drifting as far away as Lake Tahoe, combining with smoke from the two-week-old, 20,000-acre American Fire, which is nearly contained but still burning in a forest west of the lake, tainting the air over the Tahoe-Reno area. 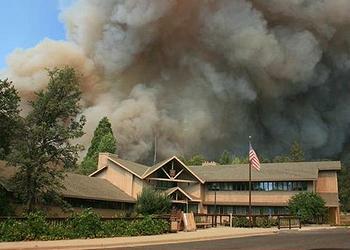 The cost to fight the Rim Fire now has topped $7.8 million. The cause of the fire remains under investigation. As firefighters from across the state continue to combat Tuolumne County’s Rim Fire, Governor Brown today secured federal financial assistance to help ensure the availability of critical resources needed to extinguish this massive blaze. California received approval from the Federal Emergency Management Agency for a special Fire Management Assistance Grant which provides funds to reimburse eligible firefighting expenses.